When you run out of space in your warehouse, the choices are clear. You can add new space or you can create more space in your current facility. The most practical, low-cost solution is to find and use the hidden space in your warehouse. How to Save Warehouse Space: 153 Tested Techniques will show you how! Youll turn to How to Save Warehouse Space: 153 Tested Techniques again and again as you are constantly pressed to save space. Its a practical working manual that will help you maximize the capacity of your facility. How to Save Warehouse Space will show you 19 innovative ways to save space by getting excess and obsolete inventory out of your warehouse. Youll learn what to do with old stock and how to reduce the space needed to store it. Youll discover 22 ways to save warehouse space by reducing inventory on-hand. Everything from implementing JIT delivery to cross-docking to controlling SKU proliferation is covered. Without making any physical changes, procedural changes will help you save space in your warehouse. Here are 26 techniques that include pallet optimization, computer directed putaway and random storage. How to Save Warehouse Space describes 77 techniques for saving space through physical changes in the warehouse. Detailed illustrations show typical layouts and how to improve them along with information on the specialized equipment which makes some of these layouts possible. 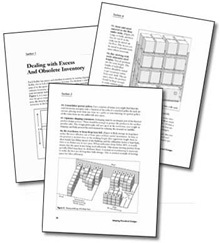 This chapter also shows how changing storage modules can increase storage density and save space. A well-designed WMS can provide information on the status of products and storage locations more quickly than manual methods. How to Save Warehouse Space: 153 Tested Techniques provides 9 specific examples of how to use this information to increase your space utilization. Jack Kuchta has helped hundreds of managers save space in warehouses worldwide. He is a management consultant who specializes in facilities and operations design for manufacturing and distribution. A vice president with Gross & Associates, he has many years of warehouse operating and consulting experience. From the depth of his experience Mr. Kuchta has developed this space-saving manual for you. 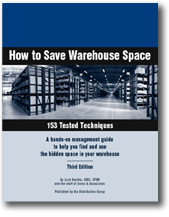 How to Save Warehouse Space: 153 Tested Techniques is published by the Distribution Group, a division of Alexander Communications Group, Inc. The Distribution Group is committed to providing the highest quality management information on warehousing and distribution through its newsletters and books. If for any reason you are not totally satisfied with How to Save Warehouse Space: 153 Tested Techniques, simply return it within 30 days for a complete refund.